Ronaldinho is a notable world-renowned Brazilian soccer player. He plays as a forward and attacking midfielder on the field. In 2004 and 2005 he received the FIFA World Player of the Year award. He is considered one of the finest players of the generation given his noteworthy performances throughout seasons. He is recognized for his excellent techniques, dribbling, overhead kicks and free kicks. He has played for Paris Saint-Germain, FC Barcelona, Milan and the national team of Brazil. His name was included in the list of greatest living athletes of the world issued by Pele as FIFA 100. 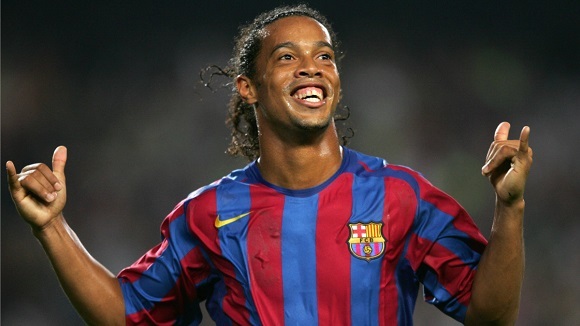 On 21 March 1980, Ronaldo de Assis Moreira was born in Porto Alegre, Brazil. His mother was a salesperson and a nurse, while his worked at a shipyard. The football fever ran in his family. His father used to play for a local club Esporte Clube Cruzeiro. After his father’s death, Ronaldo’s older brother took over and signed with Grêmio who had him move to a more affluent Guarujá area of Porto Alegre. However, Robert’s injury ruined all his plans for football. When Ronaldo turned eight, he began to exhibit signs of a potential soccer player. He was given the nickname Ronaldinho for being smallest player in youth clubs. As a child he had interest in futsal and beach football which later developed into passion for professional football. It was not until Ronaldo was thirteen when his performance called media’s attention. He scored 23 goals in a 3-0 victory against a local club. It became clear as a day that Ronaldo had the potential to make as a professional soccer player when he scored two goals on penalty kicks in under-17 1997 World Championship. With that outstanding performance, he became Brazil’s rising star. Ronaldo’s began his career with the Grêmio youth team. He made his senior player debut in 1998 and the following year he scored twenty-three goals in forty-eight matches, winning the Rio Grande do Sul State Championship final. He also helped his club win Copa Sul-Minas. He received offer from Arsenal to play for them but he couldn’t obtain work permit as a non-EU player. On another occasion he considered playing for Premiere League of Scotland which also did not pan out as he was involved in a passport scandal. In 2001, he eventually succeeded in obtaining a spot in a foreign club. He was transferred for €5 million to Paris Saint-Germain on a five-year contract. He received the number 21 shirt and made his league debut for the club on 4 August 2001. In the seasons that followed he scored several goals against Monaco, Rennes, Lens and Lorient. In addition to that, he played a crucial role in helping Saint Germain team reach the semi-final of the Coupe de la Ligue. Following his outstanding career with the French club he was transferred to FC Barcelona who outbid Manchester United with €30 million offer, reportedly. In his debut with Barcelona against Milan he scored a goal cementing a 2-0 victory.